William Samuel Gubelmann (1865-1959) was an US inventor and businessman, who held hundreds of patents, mainly in the field of adding machines, accounting machines and cash registers. In 1959 Popular Mechanics magazine called Gubelmann the father of all calculating machines in use today. The New York Times said that his inventions formed the basis of the business machine industry. Gubelmann licensed his inventions to huge companies like Remington, IBM, and National Cash Register, and was involved in substantial litigation with later. 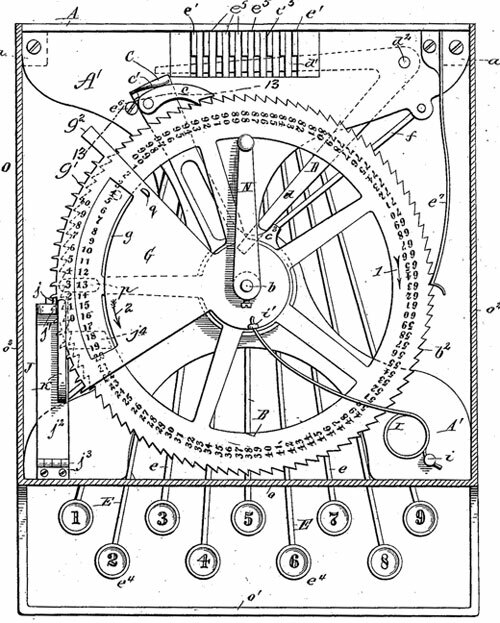 The first patent for adding machine Gubelmann obtained in 1893 (US patent №507810). It was a simple one-column keyboard adder (see the lower patent drawing). The patent relates to an adding machine in which a registering wheel or disk containing a row of numbers and inclosed in a suitable casing is rotated by a series of key levers, each key lever being provided with a number. Upon depressing one of said key levers, the registering wheel is rotated so as to expose, through an opening in the casing, a number corresponding with the number on the key lever, and upon depressing two or more of the key levers, successively, the number representing the numbers on all of the key levers depressed added together will be indicated on the registering wheel through the opening in the casing. One of the most famous patents of Gubelmann was US1429201A from 1922. It was for an adding machine with a plurality of sets of totalizer wheels and associated printing mechanism capable of printing items introduced into the sets of totalizer wheels, and also of printing totals under control of either of the sets of totalizer wheels. It was further characterized by mechanism whereby items introduced are printed, a subtotal may be printed, and the subtotalizer cleared, without disturbing the amount standing on a grand totalizer. Strangely, little is known about this remarkable businessman and inventor—William S. Gubelmann. William Samuel Gubelmann was born as Gulielmus Samuel Gubelmann in St. Louis, Missouri, in July, 1865. He was the son of Rev. Jacob Samuel Gubelmann (1836-1919) (see the nearby portrait), born in Switzerland, and Sophia E. Holste–Gubelmann (1843-1924), born in Germany. 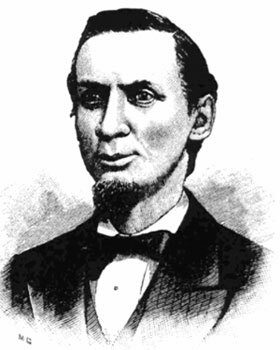 Jacob Gubelmann was born in Bern, and came to America at age of 12 in 1848 together with his father–Rev. Henry Gubelmann (1811-1883). Next year Jacob was converted and baptized in New York, then in 1852 entered Theological Seminary in Rochester, then graduated at Rochester University in 1858. Later he served at churches as pastor for 25 consecutive years, in Louisville, KY (1860-1862), St Louis, MO (1862-1868) (where he married to Sophia Holste and their first child William was born in 1865), and Philadelphia, PA (1868-1885). In 1885, he was called to Rochester Seminary as teacher, this place he held for 30 years. Besides William, the family had also Bertha (b. 1867), Albert (b. 1876), and Ella (b. 1878). William Gubelmann married to Janette E. Gubelmann in 1891, they had Dorothy (b. 1893), Mildred (b. 1898), Gladys (b. 1899). Later William Gubelmann married to Julia Gubelmann and they had a son Walter (1908-1988). William Gubelmann started his career as inventor in 1884, when he began working on a model of the typewriter. His first patent (for a cuff retainer, US patent 362000) he obtained in 1887. His patents have been challenged and claimed thousands of times, but he was one of those rarities, who got rich from patents, as his fortune was derived for some 50 years royalties on his patents. William Gubelmann had a passion for yachting and one of his prized possessions was a square-rig, 3 mast, 168-foot yacht called the USS Seven Seas. William Samuel Gubelmann died in New York on 26 September, 1959.